The Professional Series Laptop Workstation from Fellowes has received an Ergonomics Excellence Award from FIRA International. The Ergonomics Excellence Award recognises companies who design and manufacture ergonomically outstanding products, especially those that meet and generally exceed the requirements of British and European standards. The FIRA International team found the workstation to have key ergonomic features, a standout one being its varied height adjustment functionality. With nine different height variations, the workstation enables users to reach an ideal height setting of their laptop screen to reduce flexion and protraction of the head and neck. It also includes a document holder at the front of the product to encourage in-line working negating the need for users to look down at their desk or elsewhere on their workstation. The product’s cable management USB hub system helps minimises clutter, resulting in a clearer desk. Following the assessment of the Professional Series Laptop Workstation, Levent Caglar, Head of Ergonomics at FIRA International said, “Health and wellbeing are key to improving our life at work and at home. Even the smallest of changes, such as having the right workstation can make a big difference. FIRA International also confirmed that the workstation met the applicable requirements of BS EN ISO 9241-5:1999 Ergonomic requirements for office work with visual display terminals (VDTs). Workstation layout and postural requirements. 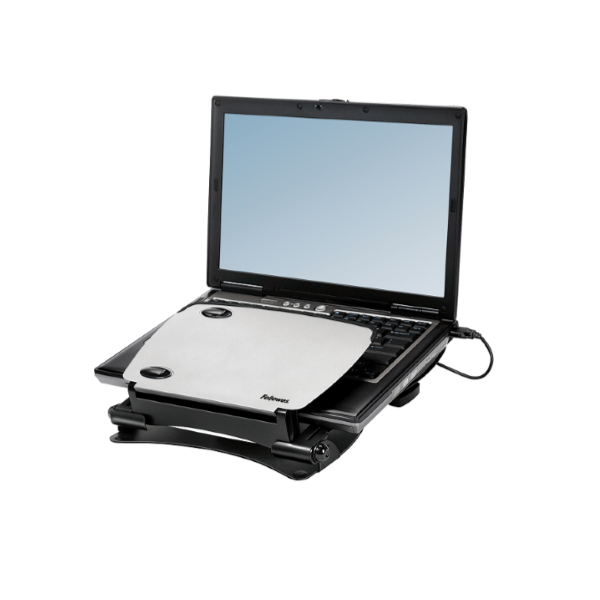 Further details on the Fellowes Professional Series Laptop Workstation are available here, whilst www.fira.co.uk/ergonomics has information on further FIRA ergonomic award holders.